The Savannah cat breed is achieved by crossing a domestic cat and a serval. A serval is a medium sized wild African cat. These cats are recognizable by their tall and sleek bodies, large ears and paws, and long legs. The Savannah cat breed is one of the newer breeds and it has only been mastered by very few breeders across the world. It takes a unique understanding, patience, and knowledge to be able to breed a domestic house cat with an exotic animal. A Savannah cat has a short to medium-length coat with a slightly coarse texture that can be brown-spotted tabby, silver-spotted tabby, black, and black smoke. There are several classifications for these kittens. They are based upon how much wild serval is bred into the savannah cat. These descendants of the serval will range from 5% to 65% wild serval. 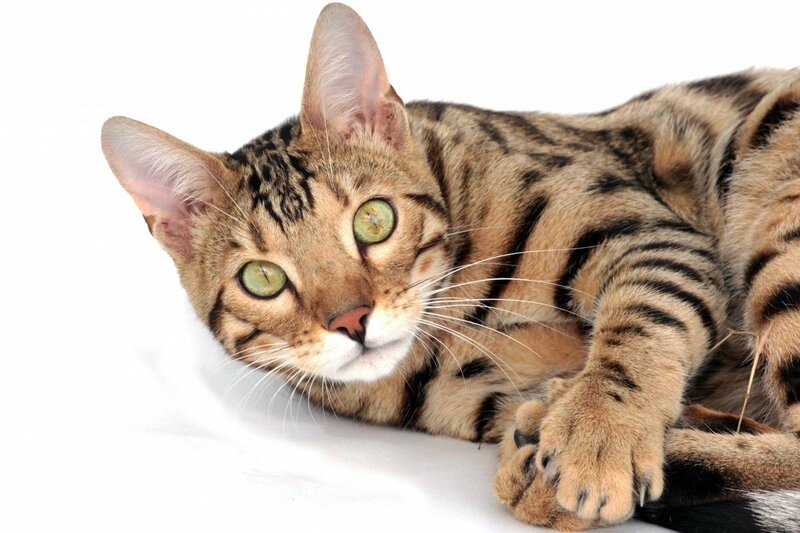 You can expect to pay up to $20,000 for an F1 Savannah cat and around $1500 for an F5 female. An F1 is 50 percent serval and an F5 is 11 percent. A generally health Savannah cat can live between 12 to 15 years. These cats are loving pets, but they aren’t going to be your typical lap cat. They are extremely loyal and may often follow you around the house. One fascinating fact about these cats is that they are easier to train than other cats and often love playing fetch. Who doesn’t want a cat that can fetch!? Unlike most domestic cats, the Savannah cat loves water. Make sure you keep those toilet lids down or else your 4-legged friend may engage in some messy fun. These cats can keep you on edge because they have quite the jumping ability. It isn’t abnormal for the Savannah cat to jump on top of cabinets, doors, or even refrigerators. Who doesn’t love a good game of hide and seek? Savannahs have a short, luxurious, soft coat that is easy to care for with weekly brushings. Your cat will love the attention and the more you brush your cat the less hairballs you will find hidden around your house. Other than the fur, the rest of the cat maintenance is fairly simple. Trim the nails as needed, usually weekly. Check the ears every week for redness or a bad smell that could indicate an infection. If the ears look dirty, wipe them out with a cotton ball dampened with a gentle ear cleanser recommended by your veterinarian. Brush the teeth frequently at home with a vet-approved pet toothpaste for good overall health and fresh breath, and schedule veterinary dental cleanings as needed. Start brushing, nail trimming and teeth brushing early so your kitten becomes accepting of this activity. The Savannah cat is definitely a unique breed and a great pet for those who want a little more adventure and spontaneity in their lives. Although some cats of this breed come with a hefty price tag, the appearance and intelligence make it worth it. It’s not every day you can make a somewhat exotic animal your pet.